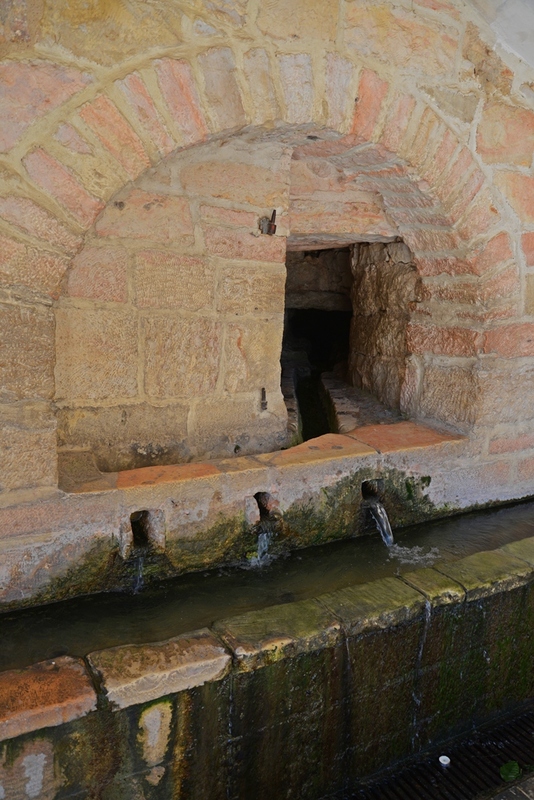 A Holy spring which was the center of the ancient village. 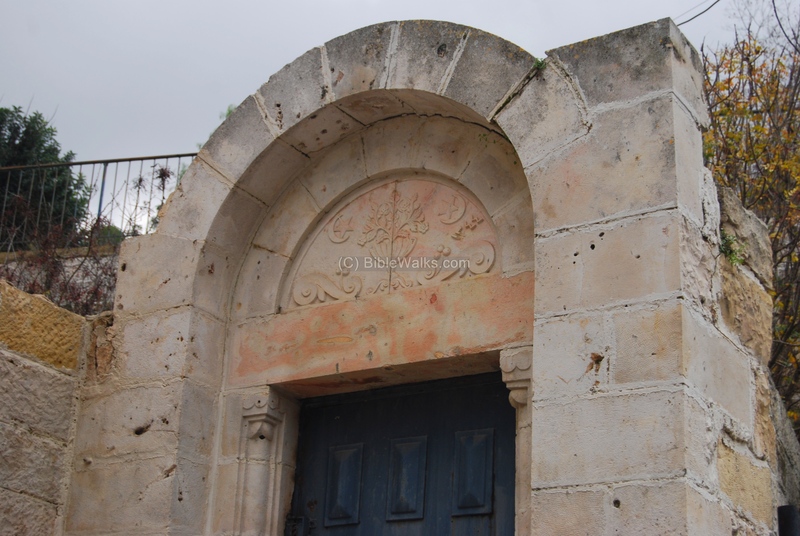 According to tradition, virgin Mary stopped here to drink while visiting John the Baptist's parents. Luke 1:39: "And Mary arose in those days, and went into the hill country with haste, into a city of Juda". The center of the ancient village evolved around the spring. The spring gave its name to the village - Ein (spring) of the Kerem (vineyard). According to Christian tradition, virgin Mary stopped here to drink from the waters. 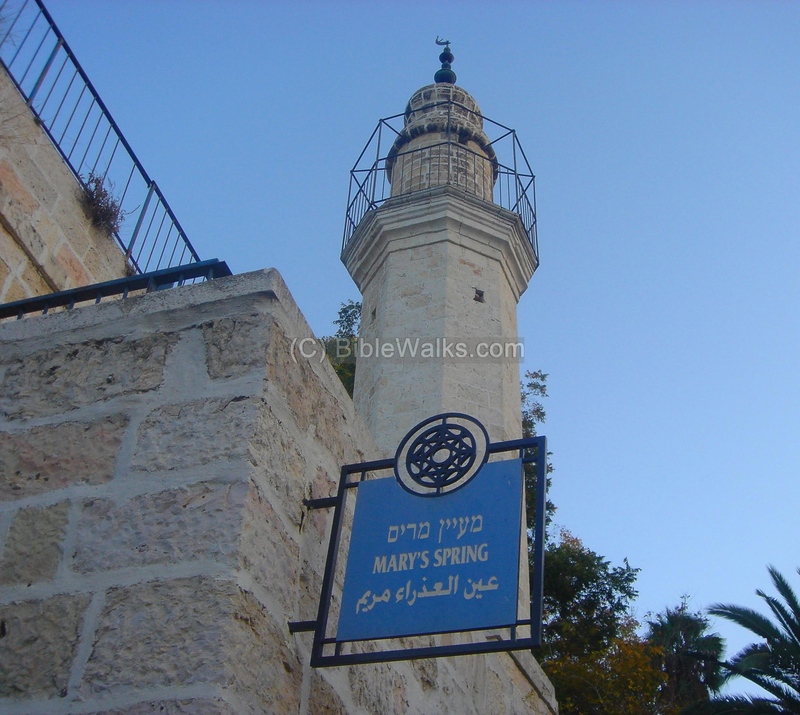 Mary's spring is located in a valley on the south side of the the village of Ein Kerem, west of Jerusalem (8KM from the center). 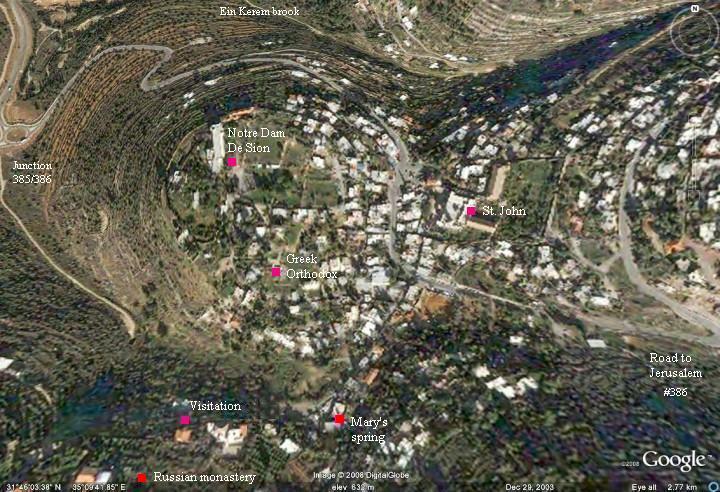 In the aerial map below the spring is located at the center of the bottom side. Pointing and clicking on selected points in purple will automatically scroll to the relevant photo or site. The spring was the nucleus of the Canaanite city in the Bronze period, and its waters were used as the main source of water for thousands of years since then. 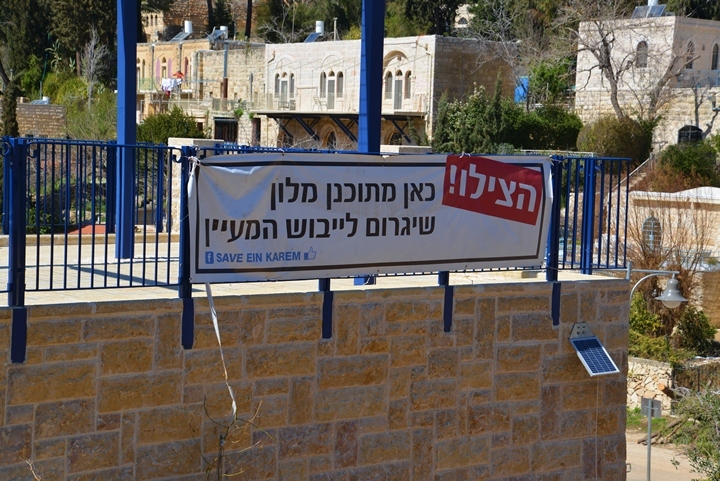 Ein Kerem is named after the spring (Hebrew: Ein = spring, Kerem = vineyard). A 30M rock hewn tunnel was constructed during the second temple period in order to increase the spring's capacity. 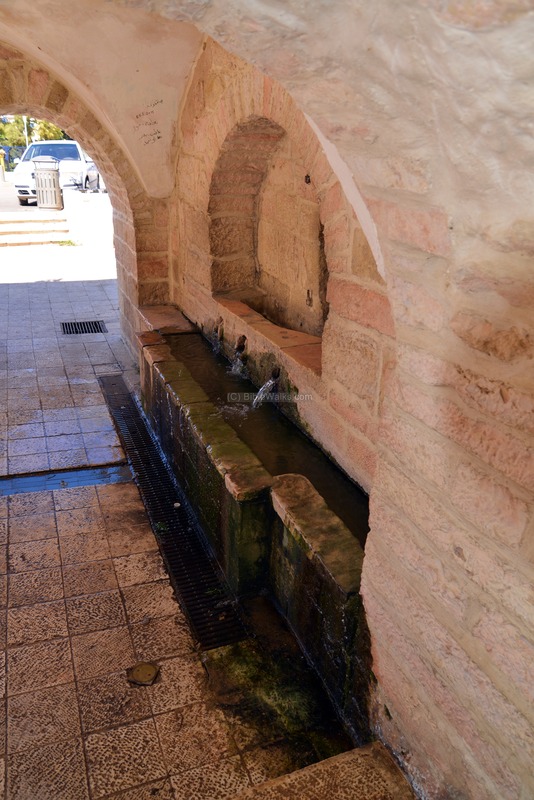 According to Christian tradition, virgin Mary stopped here to drink from the spring, and was named after Mary. Therefore, the spring is Holy for Christians. Pilgrims used to tap these waters into bottles and take them back home as a holy souvenirs. 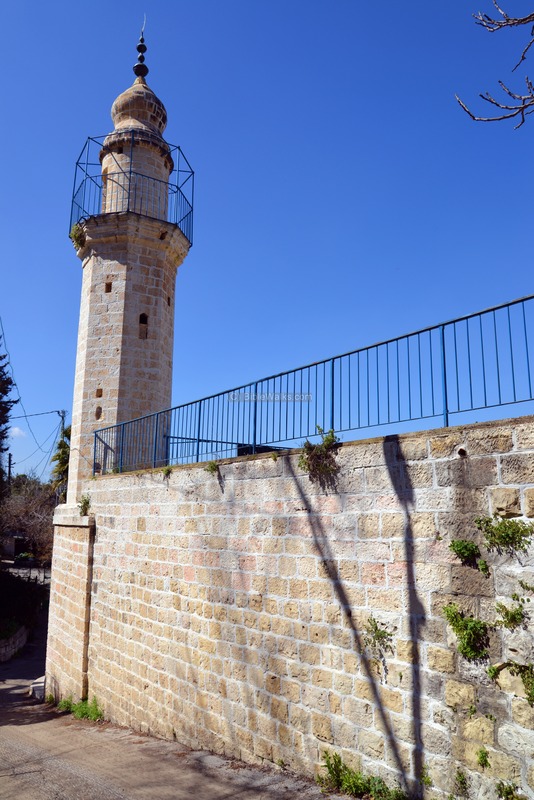 A mosque, whose tower rises above the structure of the spring, was built over Mary's spring in the 2nd half of the 19th C.
The structure of Mary's spring is seen below, with the tower of the mosque built over it. Another view of the Ottoman period structure and the tower of the mosque is seen from the rear (south-east) side. 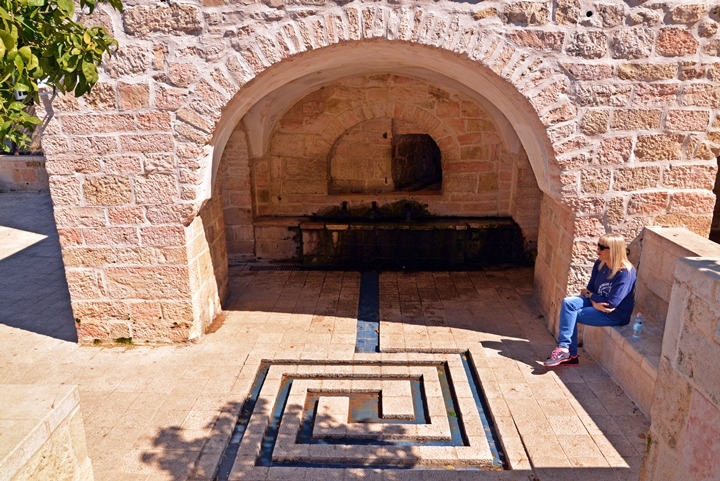 The structure was also used as a mosque and a school during the 19th C.
The spring is seen in the photo below. It was used since the Bronze age, more than 3,000 years ago. 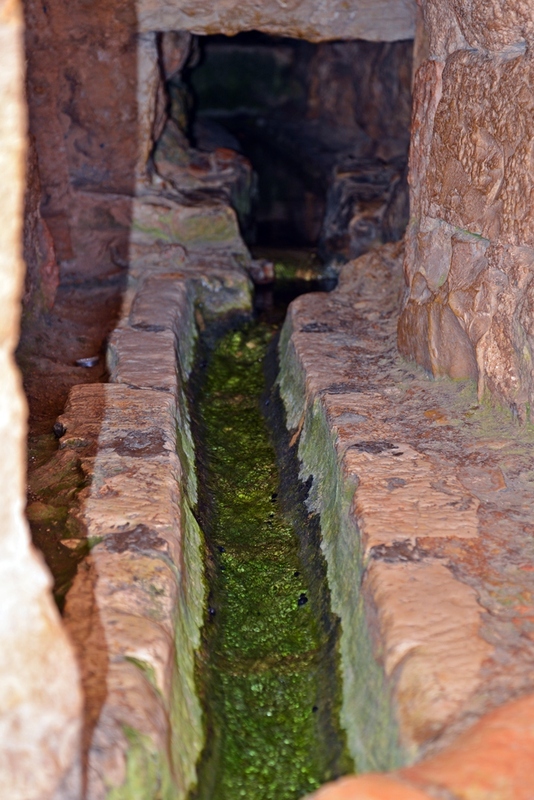 A closer view of the spring is seen below. A rock hewn tunnel, 30M long, is seen behind the outlet of the water. 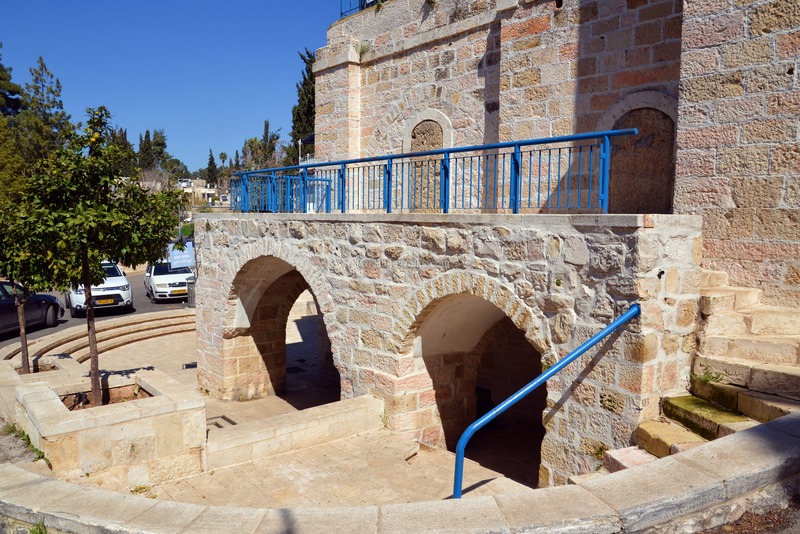 The tunnel was constructed during the second temple period in order to increase the spring's capacity. According to Christian tradition, Mary stopped here to drink from the spring, and so it was named after Mary by Christian pilgrims. The PEF report writes about it in 1881 (XVII P. 19): "The water issues from a spout into a trough". 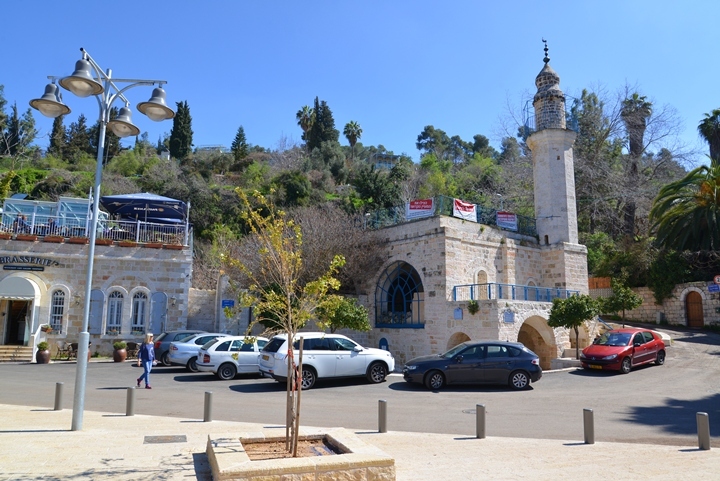 A mosque, whose tower rises above the structure of the spring, was built over Mary's spring in the 2nd half of the 19th C. The structure has three domes above a prayer hall. The PEF report writes about it in 1881 (XVII P. 19): On the south below the village is a fine spring ('Ain Sitti Miriam), with a vaulted place for prayer over it". A view of the north-west entrance to the mosque is seen below. A planned construction of a hotel near the site sparked an outcry. The sign reads "A hotel is scheduled to be constructed at the site that will dry out the spring". Biblewalks shares the hope that these plans will be scrapped by the municipality. The visit of Mary to the house of Zacharias, father of John the Baptist, in Ein Kerem ("city of Juda"). "And Mary arose in those days, and went into the hill country with haste, into a city of Juda; And entered into the house of Zacharias, and saluted Elisabeth. And it came to pass, that, when Elisabeth heard the salutation of Mary, the babe leaped in her womb; and Elisabeth was filled with the Holy Ghost: And she spake out with a loud voice, and said, Blessed art thou among women, and blessed is the fruit of thy womb. And whence is this to me, that the mother of my Lord should come to me? For, lo, as soon as the voice of thy salutation sounded in mine ears, the babe leaped in my womb for joy. And blessed is she that believed: for there shall be a performance of those things which were told her from the Lord. And Mary said, My soul doth magnify the Lord, And my spirit hath rejoiced in God my Saviour. For he hath regarded the low estate of his handmaiden: for, behold, from henceforth all generations shall call me blessed. For he that is mighty hath done to me great things; and holy is his name. And his mercy is on them that fear him from generation to generation. He hath shewed strength with his arm; he hath scattered the proud in the imagination of their hearts. He hath put down the mighty from their seats, and exalted them of low degree. He hath filled the hungry with good things; and the rich he hath sent empty away. He hath holpen his servant Israel, in remembrance of his mercy; As he spake to our fathers, to Abraham, and to his seed for ever. And Mary abode with her about three months, and returned to her own house". Ain Sitti Miriam - Arabic name of the site meaning: "the spring of our Lady Mary"
Ain Karim - Arabic name of Ein Kerem, meaning "The spring of the dresser of the soil" (PEF Arabic and English name lists volume, 1881, p. 280).